There cannot be a simpler recipe than the fresh coconut chutney. No cooking involved except the seasoning. It's a typical south Indian condiment for all iddli and dosa varieties. When I googled for coconut chutney, I saw innumerable ways to prepare. I was surprised to see few recipes with dhahi/curd or even lime juice. A variation like this or even adding onions is good for a change, but nothing can beat the real taste of the typical south Indian coconut chutney. Here is a simple recipe that my mom used to do. I, hailing from south (TN), as far as I know, this is the only recipe that my family, friends and relatives in my place do. Try it and you will love it. Roasted gram, green chillis and ginger. Now, add fresh coconut, asafoetida powder, salt and three fourth cup water and grind it to a thick consistancy. You may add or reduce the amout of water as per the consistency you desire. Transfer the content to a bowl. For seasoning, heat a teaspoon of oil. Add mustard seeds, when it pops, add the urud dal, when it turns light brown, add the slit red chilli and the chopped curry leaves. Now, add this sesoning to the coconut chutney. Mix well. Serve for any iddli or dosa variety. You can adjust the spice and as well as the consistency as per your taste. Adding roasted gram is optional. Also, grinding the curry leaves with the chutney is a good idea. Delicious and drool worthy..love to have with idli..
Can chutney be kept in the freezer and thawed and served? 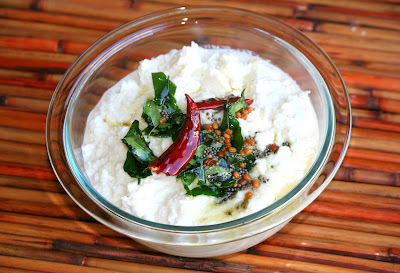 I love this coconut chutney with idli and dosa.